The Yellow Sheet, an Arizona political newspaper, is reporting that Arizona Corporation Commission chairman Tom Forese fired ACC Executive Director Ted Vogt not because of his wife’s ties to Arizona Public Service, which had been well known, but because Vogt had been urging Forese to act against the utility’s interests. The Yellow Sheet cited two unnamed sources with knowledge of the situation. If true, the news would be the height of irony: Forese claimed to fire Vogt because his wife’s ties to APS compromised his ability to work in the public interest. But if the Yellow Sheet’s sources are correct, then Forese was the one acting in APS’ interests in firing Vogt, who had apparently become a problem for the company. That story would be consistent with Forese’s history: he was elected in 2014 with the aid of millions of dollars in dark money, allegedly provided by APS. Since then, he has generally regulated in APS’ interest, including in recent rate increases for the company. The Yellow Sheet is behind a paywall, but the report cited two specific cases where Vogt suggested Forese challenge APS’ interests, advice which he refused. First, Vogt refused to play ball with a Forese plan to delay a rehearing of APS’ rate increase until after the election, when the issue wouldn’t be so politically toxic. The Energy and Policy Institute reported that rehearing timeline as a possible issue in Vogt’s firing in this blog post on July 6. Second, Vogt wanted the ACC staff to weigh in formally to say that an APS-sponsored bill designed to undermine a renewable energy ballot initiative toothless was unconstitutional. That bill (HB 2005) would have removed any penalties to APS if it did not comply with the new renewable energy law. Forese denied the claims. “That’s ridiculous. Absolutely not correct. I did not want Ted Vogt off the commission at all. I like Ted quite a bit. One of the most difficult things I’ve ever done,” Forese told the Yellow Sheet. Forese acknowledged that he had long been aware about Annie Vogt’s work for Veridus. He said his firing of Vogt was triggered by people bringing up the Ted/Annie Vogt conflict, citing a Yellow Sheet story that mentioned it. But Annie Vogt’s name had not appeared in any Yellow Sheet story. The executive director of the Arizona Corporation Commission (ACC), the body which regulates the state’s monopoly utilities including Arizona Public Service resigned yesterday due to a conflict of interest related to his wife’s work on behalf of APS in the latest scandal to engulf the agency. Ted Vogt, the executive director of the ACC, notified the commissioners in a letter on July 2 that his wife works for Veridus, a PR and lobbying firm that has led APS’ campaign against a clean energy ballot initiative throughout 2018. Two of the commissioners, Tom Forese and Justin Olson – both of whom are up for reelection this November – responded with a request for Vogt’s resignation, according to reporting in the Arizona Republic. Two others, Boyd Dunn and Bob Burns, also expressed concerns. The commissioners’ letters implied that they learned about the conflict of interest only upon receipt of Vogt’s letter. That explanation could be an effort to protect the commissioners themselves from any political fallout, and to position Forese, long perceived as an ally of APS himself, as a champion of ethics, but it beggars belief: Ted Vogt’s marriage to a senior Veridus employee, and Veridus’ work on behalf of APS, were both well known at the Commission long before this week. 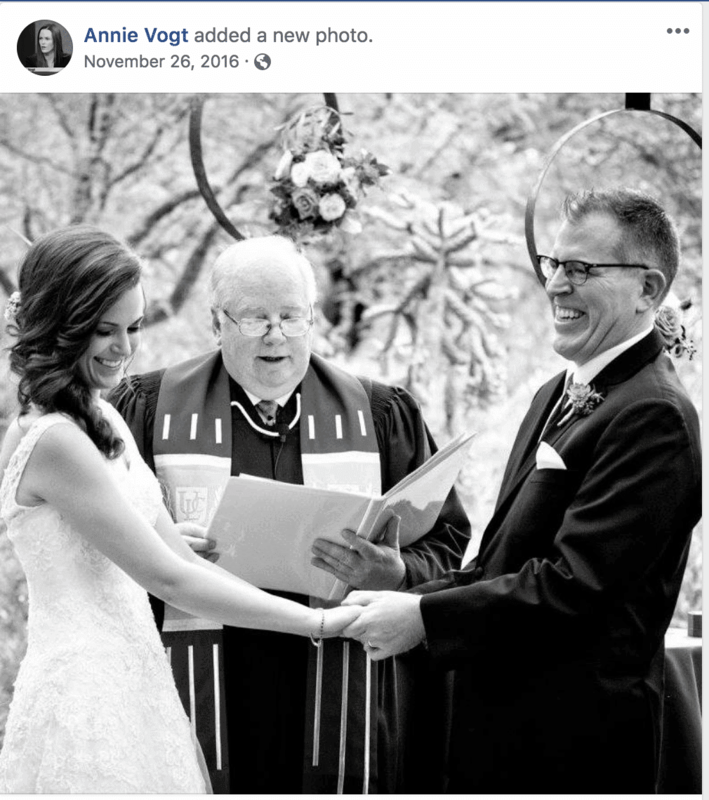 ACC Commissioner Andy Tobin personally officiated the wedding of Ted and Annie Vogt in October, 2016, according to pictures posted on social media. (Tobin was the only commissioner not to send a letter criticizing Vogt’s conflict of interest or asking for his resignation, according to the Republic.) Annie Vogt has worked at Veridus since September, 2016. Ted Vogt was hired by the ACC commissioners as executive director in January, 2017. Arizona Corporation Commissioner Andy Tobin officiates the wedding of ACC Executive Director Ted Vogt, and Annie Vogt, who works for Veridus, a PR firm hired by APS to fight a clean energy ballot initiative and influence ACC elections. Vogt resigned due to the conflict. Annie Vogt’s work on behalf of APS was also well known. 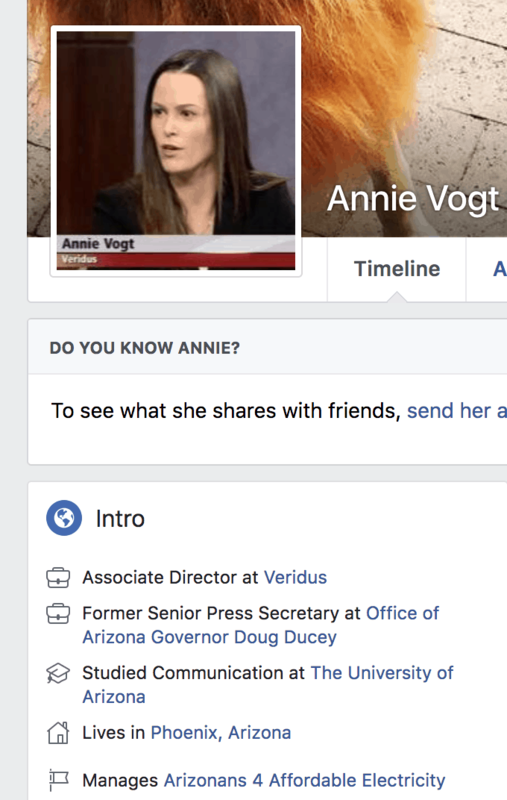 She manages the facebook page of “Arizonans for Affordable Energy,” the group that has received $1.2 million through March from APS to attack the clean energy ballot initiative. She has aggressively tweeted against the ballot initiative for months. Neither would Veridus’s relationship to APS have been news to any of the commissioners. In addition to the highly contentious campaign over the clean energy ballot initiative that Veridus has waged on APS’s behalf, APS also spent millions on the 2016 ACC elections via a political action committee called the AZ Coalition for Reliable Electricity. That group’s only major operating expenditure during that election was $25,000 to Veridus, according to campaign finance records. 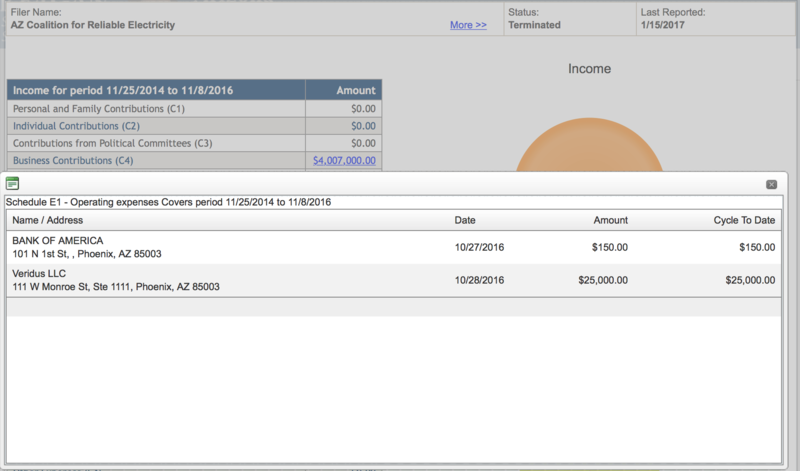 In the 2016 ACC elections, APS spent millions on the AZ Coalition for Reliable Electricity, who in turn hired Veridus. It’s not clear whether other motivations were at work in Forese’s decision to fire Vogt, who managed the ACC’s Staff, giving him an impact over decisions affecting Arizona Public Service including controversial recent rate increases. Forese recently asked the Staff to intervene in a challenge to the 4.5% rate increase on APS customers that the ACC approved last year. The Staff complied with Forese’s request last week, saying that it would intervene, and also proposing a calendar that would have the ACC decide the issue in 2019. The timing is key: APS had expressed concern that the rate hike rehearing would be in the headlines just as ACC commissioners Forese and Olson were up for reelection this November in a surprisingly brazen line in a brief in the case. “Unfortunately, APS is concerned that delay will only push this matter closer to the November 2018 election, which risks distorting this process amid increasing customer confusion,” the company’s lawyers wrote in March. The Staff’s proposed schedule neatly resolves APS’ concern by delaying any decision from the ACC – most likely the unpopular one to reaffirm APS’ rate increase – until after the election. It’s not known what role Vogt may have had, if any, in acceding to Forese’s request or determining the new schedule. 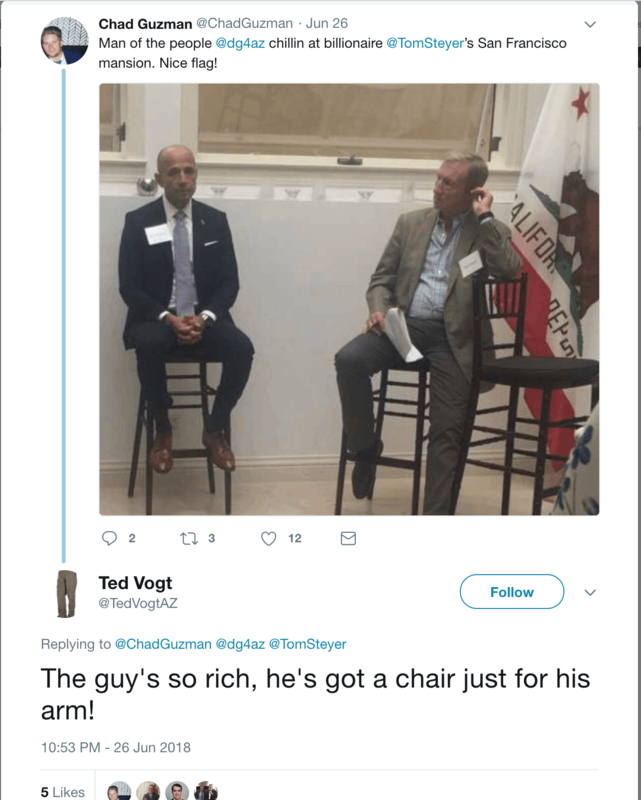 Ted Vogt responds to APS lobbyist Chad Guzman’s tweet about David Garcia and Tom Steyer. Ted Vogt’s resignation is the latest shoe to drop for a Commission that has weathered a series of challenges to its integrity since APS allegedly began spending millions of dollars to elect its regulators via dark money groups in 2013 and 2014, a claim it has never confirmed or denied. The FBI investigated whether a recent chairman of the ACC, Gary Pierce, helped protect APS’ monopoly in exchange for APS giving money to his son’s political campaign. A jury is currently deliberating whether Pierce is guilty of bribery in a separate federal corruption case that does not involve APS. Another commissioner, Susan Bitter-Smith, resigned in 2015 for working a second job for a telecom industry group. Yet another commissioner, Bob Stump, came under a cloud of scandal over text messages that he allegedly deleted which may have shown communications between him and dark money groups who were attacking solar power. 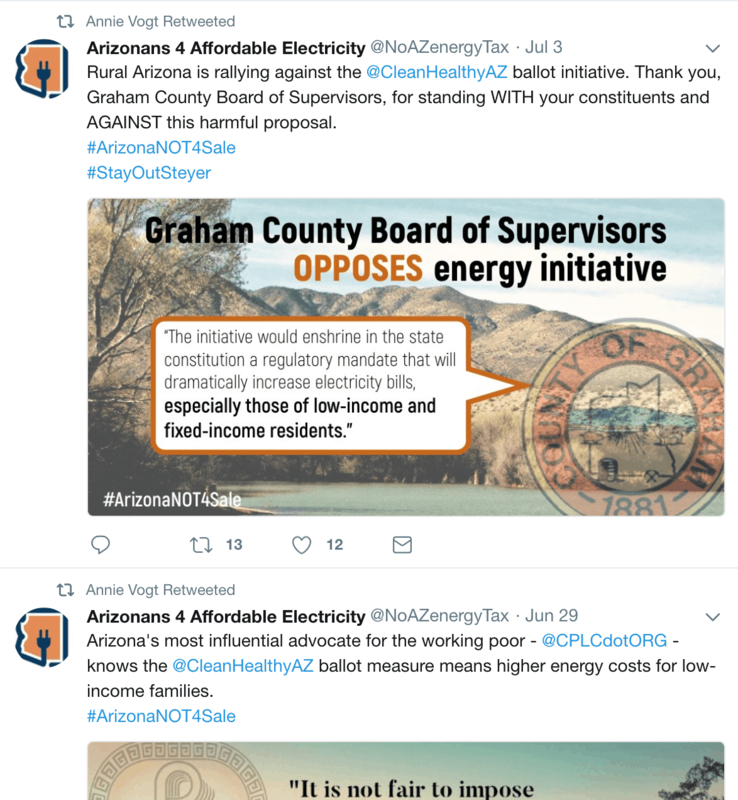 Stump’s term on the ACC ended in 2017, but he announced earlier this week that, after a failed bid for Congress, he would be running a trade association for Arizona’s electric utilities, called the Arizona Energy Policy Group, which filed to intervene in an APS rate case before the ACC.